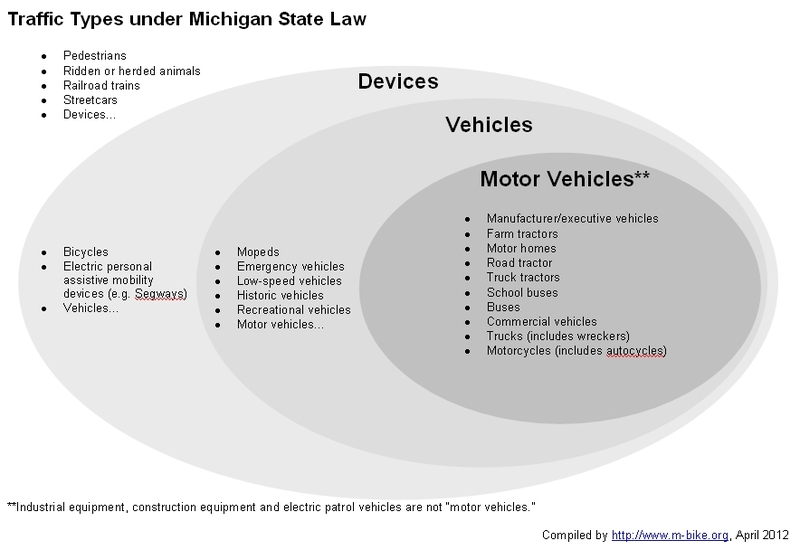 Despite what you may read or hear, under state law bicycles are not vehicles in Michigan. Yes, this differs from some other states, but that is what Michigan law says. And cities such as Ann Arbor adopt the state law definitions for vehicles and bicycles. “Vehicle” means every device in, upon, or by which any person or property is or may be transported or drawn upon a highway, except devices exclusively moved by human power or used exclusively upon stationary rails or tracks and except, only for the purpose of titling and registration under this act, a mobile home as defined in section 2 of the mobile home commission act, Act No. 96 of the Public Acts of 1987, being section 125.2302 of the Michigan Compiled Laws. We’ve highlighted the key point. If you’re human powered, you’re not a vehicle in Michigan. There are many traffic types defined by state law. We’ve put together this graphic which shows the relationships between them. If bicycles aren’t vehicles in Michigan, how are we granted access to most of the roads? Bicyclists are do not have the same duties as an vehicle owner. We don’t need to register and license our bicycles with the state. And as the definition shows, there are exceptions. As we’ve said before, those “same roads, same rights, same rules” stickers are simply wrong. Why can bicycles ride on sidewalks? It is against most Michigan municipal ordinances to drive vehicles on sidewalks under the Uniform Traffic Codes. So why isn’t bicycling always illegal on sidewalks? 257.660c Operation of bicycle upon sidewalk or pedestrian crosswalk. (1) An individual operating a bicycle upon a sidewalk or a pedestrian crosswalk shall yield the right-of-way to pedestrians and shall give an audible signal before overtaking and passing a pedestrian. Of course municipalities can locally prohibit bicycles from sidewalks. This leads into another subject. The false notion that bicycles can impede traffic while operating legally. That’s something we’ll cover in a future post. This entry was posted on Thursday, April 5th, 2012 at 12:03 pm	and is filed under Law. You can follow any responses to this entry through the RSS 2.0 feed. You can leave a response, or trackback from your own site. While the MVC does not define a bicycle as a vehicle, I think that the courts have taken it upon themselves to have done this. Kind of like when they took it upon themselves to say that you must signal lane changes, not just “changes of direction”, as said in the MVC.